For the travelling aircraft spotter or photographer, it is an obvious and pertinent question. Where is the best place in Europe to see Air Berlin’s fleet of Boeing 737s and brand new Airbus A320s in large numbers? The immediate answers could range from Berlin through Munich, Dusseldorf, Nuremberg, Hamburg by way of Hannover or Cologne/Bonn. These would however be wide of the mark. To see this rapidly expanding fleet in their droves, the enthusiast must head south, and to Palma de Mallorca in particular. Air Berlin’s operation at Palma de Mallorca (PMI/LEPA) is impressive by any standards. Even in low season, at certain times of the day, the airline schedules up to 48 arrivals and departures in the space of less than two hours. Most of the airline’s services use gates from the airport’s ‘D’ pier which allows for ease of connection between flights. During busy periods, every one of these gates can be occupied by an aircraft of Air Berlin or its Austrian associate Niki. At other times, most of these positions are empty. The reason for this is a simple one; the majority of the airline’s flights operate in waves, co-ordinating arrivals and subsequent departures to allow for straightforward onward connections. Air Berlin markets itself as a low cost carrier ‘with frills’. Service on each of its flights offers complimentary food and soft drinks along with more substantial hot meals and alcoholic beverages for sale. The airline has established a huge network of intra-European flights with a large number of additional destinations now marketed with through fares involving a single change of aircraft. Nowhere is this seen to better effect than in Mallorca. The Balearic Islands, of which Mallorca is the largest, have always been popular with German holidaymakers and property owners. As a result, Palma has been central to the airline’s network of scheduled services. Under EU regulations, airlines from within the Community are able to start and operate services within other member states. 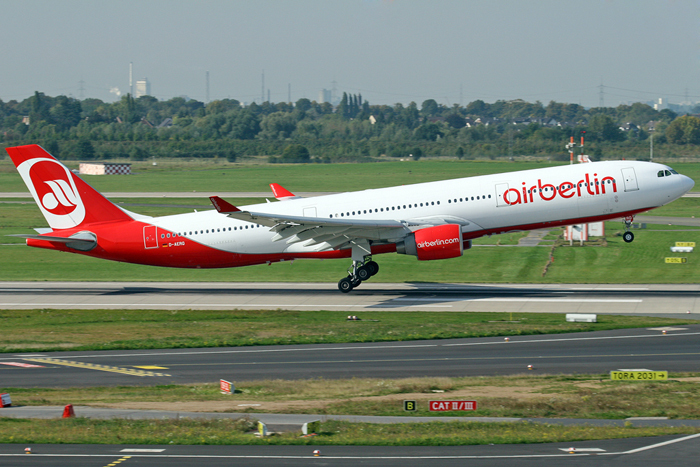 With this change in rules, Air Berlin saw a ready opportunity to provide additional feed to its flights from Mallorca to Germany and beyond. The passenger from Germany, Austria, Denmark, Italy, the Netherlands, Switzerland or the UK can now fly cheaply to a whole host of destinations in Iberia with a simple change of plane in Palma. The airline now schedules flights from Mallorca to 14 Spanish cities with a further 3 in Portugal. The system works seamlessly allowing minimal connection times and distances between aircraft. Flying recently between Málaga and Zurich, this author was able to sample the procedure at first hand. Leaving the Costa Del Sol on a domestic flight to Palma, the transfer to the next service involved walking into the terminal from one aircraft and moving two gates to the next. The return journey was equally painless and quick. The airline has been building the Palma operation for some years and its function is slick and professional. Air Berlin’s hub operation in Palma de Mallorca is a gift for the aircraft enthusiast who wants to capture as many aircraft as possible in one place in the shortest period of time. More importantly, the airline’s scheduling has opened up large parts of Spain and Portugal to high quality low-cost services with the minimum of hassle for the airlines growing legion of loyal customers.